mommy bytes: Happy Earth Day - Get Out Your Bikes! Happy Earth Day - Get Out Your Bikes! This post was originally published on BlogHer for Earth Day last year. When I was a child, biking meant freedom. I could bike within my neighborhood to a friend's house or to the playground without any parental supervision. These days, children are rarely allowed to roam free, but the spring air is enough for me to taste the sweet freedom of biking from my childhood again. As an adult, I bike for exercise but also as a fun family activity. 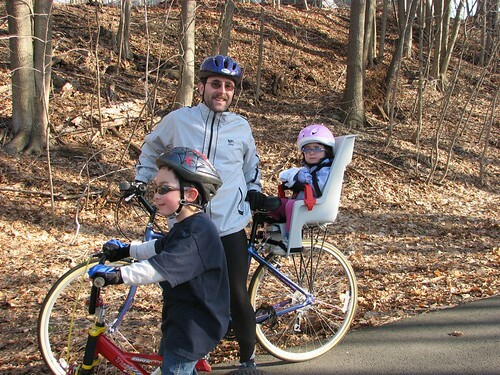 When our kids were babies, we stuck them in the bike carrier and took them for rides along a nearby rail trail. They always complained in the beginning, but enjoyed the ride as soon as we got moving, and often fell asleep. 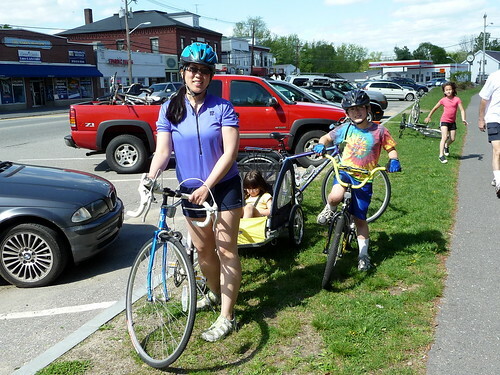 As my son got older, he was able to bike along side us, with his baby sister in the bike carrier or trailer. 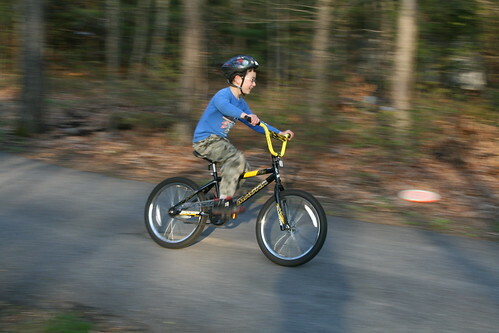 Now my 8-year-old son loves his bike and flies up and down the driveway any moment he can get. Unfortunately, we don't live in an area where kids can bike on the roads unsupervised, but he is perfectly happy making donuts in our driveway. 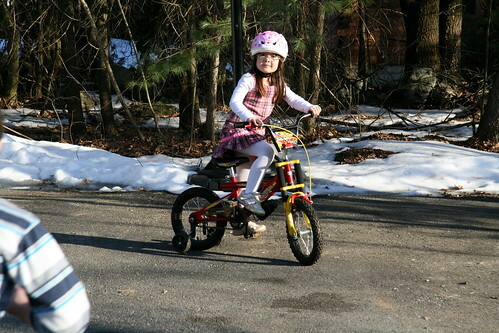 This spring before the snow even melted, my 5-year-old daughter couldn't wait to ride her bike. Wear a properly fitted helmet. Kids' heads grow, so check their helmet fit every year. Inflate tires properly. 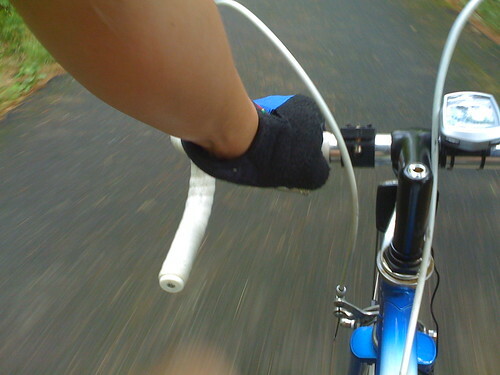 A bicycle is a vehicle just like a car, and when tires are not properly inflated, accidents can happen. Check your brakes. Brake pads dry out over the years and are cheap to replace. Always ride with the flow of traffic. This is the opposite rule from walking. Always stop at intersections and follow traffic signs. Never assume that cars can see you! When biking alone, carry a cell phone. In the days before cell phones, I also carried a spare inner tube, tire irons and a portable pump. I still carry these things because I'm a throwback and like to remember the time when I successfully fixed a flat on the way to work. Carry water to stay hydrated. For a complete list of safety tips, visit the bicycling safety page on National Highway Traffic Safety Administration. We are also fortunate to live near a rail trail. A rail trail is a stretch of unused railroad tracks that has been paved or otherwise converted for biking, walking, inline skating and horseback riding as well as cross country skiing and snowshoeing in the winters. It provides a safe and often scenic route away from cars and traffic. The best part of a rail trail is that it is often straight and not very hilly, ideal for beginning cyclists. When I bike alone on the rail trail, I can almost forget that I am exercising and get lost in the music, podcast or audiobook from my MP3 player. And when I'm not engrossed in music, I take in the sights of the nearby river, farms and wildlife. I've seen horses, cows, birds, rabbits and even snakes! To find a rail trail near you, visit TrailLink, sponsored by the Rails-To-Trails Conservancy. Don't forget, biking is one of the greenest ways to get around. Happy Earth Day everyone! I also wish you a very Happy Earth Day. Just imagine if all the vehicles are kept off road in the whole world, we will have so much oxygen to breath and tonnes of pollution will not be there. Thanks for posting such a nice article. Thanks for the info. I recently started biking, and it's a lot of fun! My family also love to bike. It's a great outdoor bonding activity for the whole family. I love the pictures you showed in your post. Your kids are awesome and it's good to hear that they share the same sentiments as you do with regards to being an earth-friendly person. By the way, there are a lot of cute and sassy bikes for kids available online. Your kids will sure to be thrilled seeing these hip bikes. 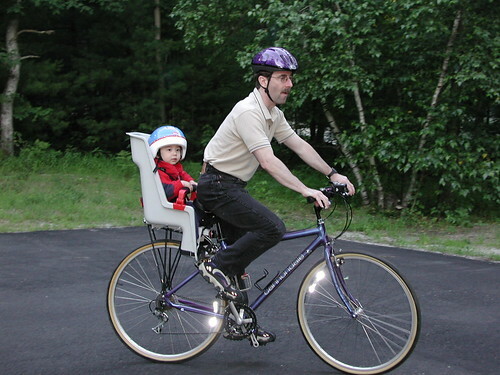 I would love to ride with my child. I am just a little nervous. I am not a bad bike, but it's a different feel with the baby on the back and I'm just a bit nervous.